Want to fix “The process cannot access the file because it is being used by another process” error. This error appears when user tries to load hive in Registry Editor for Windows 10, you can easily fix this issue by applying the given tutorial. Loading hive is reasonably vital for administrators and it technically helps the user to load registry about those user accounts, which are suffering from some issues with their profile. However, while loading hive via Command Prompt at the boot time, following error appears and failed the loading hive process. The above given error will appear when user try to load user account through Security Account Manager (SAM) file. Security Account Manager is a database file in Windows system, under this database all the data like user account password and other relevant information are store. This error generate because of mounting SAM file from wrong folder. 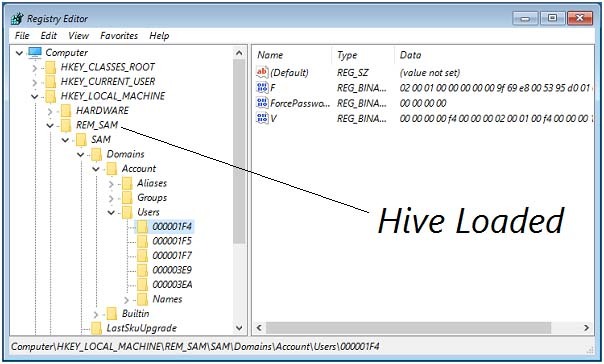 When user tries to load hive and search for the SAM file in Load Hive window, by default config folder under X: drive will open by the Registry Editor. X: is the default drive of Command Prompt at boot time, since X: drive is nothing but it is the memory in which Command Prompt is working. Therefore, because of this, error message comes into view. 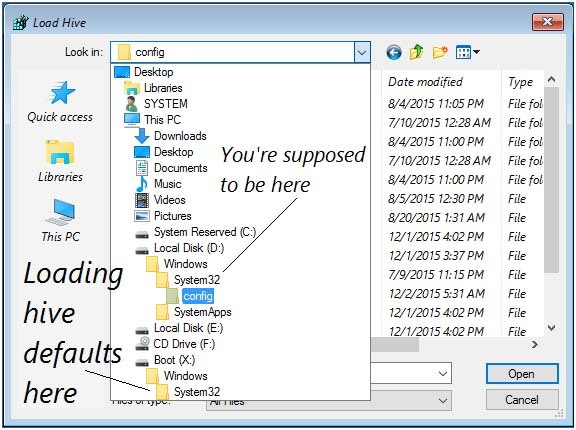 To fix this issue, you must have to click on the folder list under given section of window shown below. After it, carefully place your system root drive (it is always not C: drive).